This article is about the Covenant quadrupedal excavator nicknamed the "Locust". For the Spartan armor of a similar name, see LOCUS-class Mjolnir. "Destroy those Locusts wherever you find them. They're building killers!" The Type-30 Light Excavation/Anti-Fortification Platform (T-30 LE/AFP), more commonly known as the Locust, is a quadrupedal Covenant vehicle used for mining and combat purposes. The Locust is a smaller, tank-sized counterpart to the Scarab, which is also a repurposed mining platform. It does not share the Scarab's spiked 'feet', though it is capable of using its legs to climb over obstacles in a similar manner to its larger cousin. 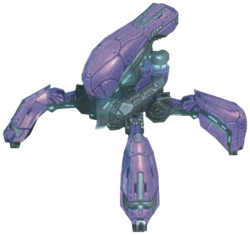 Like Type-47B Scarabs the Locust can be piloted by a Sangheili or Jiralhanae. The Locust possesses one rotating turret, which is very similar in appearance to a Type-26 Banshee's cockpit. The turret houses a single plasma cannon that fires a linear pink beam; this beam is effective against both ground and air targets and can outrange most equivalent weapons. The Locust has a regenerating shield that is capable of protecting the vehicle from a limited amount of weapons fire. In February 2531 Locusts were used by Covenant forces on Arcadia and Etran Harborage in long-range artillery roles against UNSC forces. In the post-war era, remnants of the former Covenant empire still used the Locust, though their roles have somewhat changed: while some are employed by fierce Jiralhanae raiding parties looking to pillage colony worlds, Sangheili kaidons and warlords used them to fortify keeps and protect fragile alliances. In September 2558, a Jiralhanae chieftain named Hekabe had access to Locusts during his attack on Carrow. The Locust has the longest effective range among the Covenant ground units in Halo Wars and costs 300 resources, a tech level of 2, and a population space of 2. The Locust is specifically designed to take down static targets, and is only able to open fire when stationary. The Locust can be upgraded with the 'Overdrive' ability as well as with the 'Shield Amplifier' ability. The former upgrade allows the Locust to divert energy from its shield generator to its main cannon, increasing its attack power; the latter upgrade allows the unit's shield to regenerate faster. Known as a 'building killer', the Locust is largely used to attack an enemy's defenses from a safe distance. This is a useful alternative to a direct confrontation, which would result in casualties for the attacker. A small group of Locusts can be used to assist a force of smaller warriors, like Kig-yar, making it far easier for the group to destroy enemy buildings. Larger groups of Locusts can be used in surprise attacks against enemy bases and in such cases, the Locusts can often level the targeted base in thirty seconds. However, the inherent vulnerability of the unit makes this a gamble. The Locust is fairly weak against non-structure targets. Though it is able to do significant damage to units, the Locust's defences are weak and falls quickly to concentrated fire. However, its beam can lure enemy units towards awaiting forces, allowing them to be quickly cut down. Although less common, the Locust can be used quite effectively to destroy small groups of air units such as a formation of vultures. This is provided the player has a sufficient number of Locusts and that they attack from long range to reduce the amount of casualties that will inevitably be taken. Overdrive is a special attack that drains the Locust's shields to boost damage. Requires 400 resources and a tech level of 2. Shield Amplifier increases the Locust's shield-regeneration rate. It is useful when used with Overdrive, and its effects also stacks with the 'Shield of the Forerunners' upgrade from the Temple, allowing for an even quicker regeneration rate. Requires 800 resources and a tech level of 3. When playing as the UNSC in multiplayer or skirmish modes, Serina may say, "Watch the skies — they've got Locusts." This, along with the Locust being first encountered in-game in a mission where other attacking enemy units are airborne, and the real locust being able to fly, may mean that the Locust was an air unit at some point in the development of Halo Wars. Concept art of a Locust accompanied by Jiralhanae warriors for Halo Wars. Concept explorations of the Locust. A side view of the Locust in Halo Wars. A pair of Locusts attacking a UNSC Firebase. An army of Locusts on Harvest. An army of Locusts attack a Firebase.